If you’re wondering how to get started with your ballroom dance lessons, you’re in the right spot! Our Introductory Special is available to you whether you’re a true beginner or an experienced dancer. Group classes are designed to introduce you to the dance and get you acquainted with the basic steps and patterns. Private lessons help you refine your steps, learn more intricate patterns and improve your overall dance technique and performance. Our weekly Friday night dance parties allow you the opportunity to practice what you’ve learned in your group classes and private lessons. 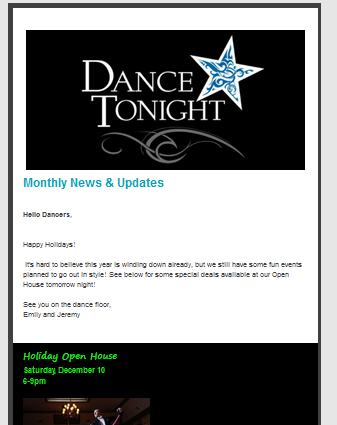 If you’re new to Dance Tonight, we hope you’ll take advantage of our special introductory rates. This intro package offer is for both beginning and experienced dancers who are coming to Dance Tonight for the first time. Call or email the studio with any questions or click the link below to book your first private lesson.